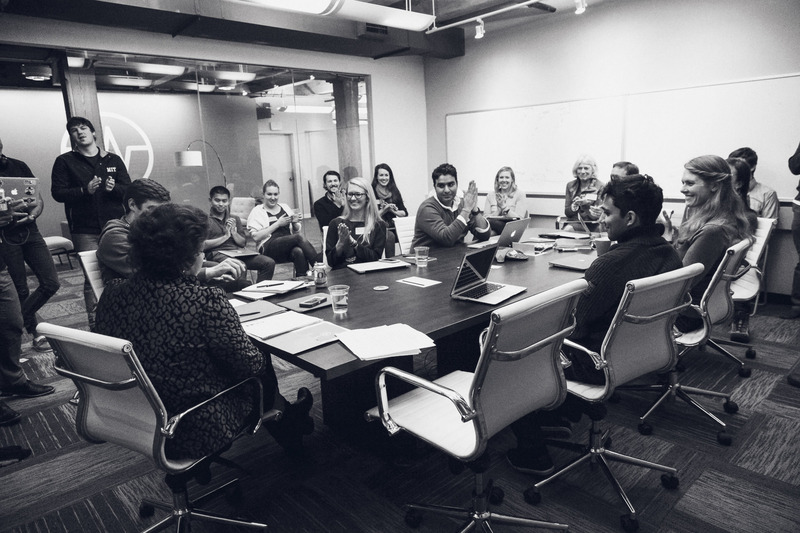 Wellframe is a Boston-based company that partners with leading health plans and healthcare providers to build an improved infrastructure for care delivery by combining clinical medicine and new technologies. 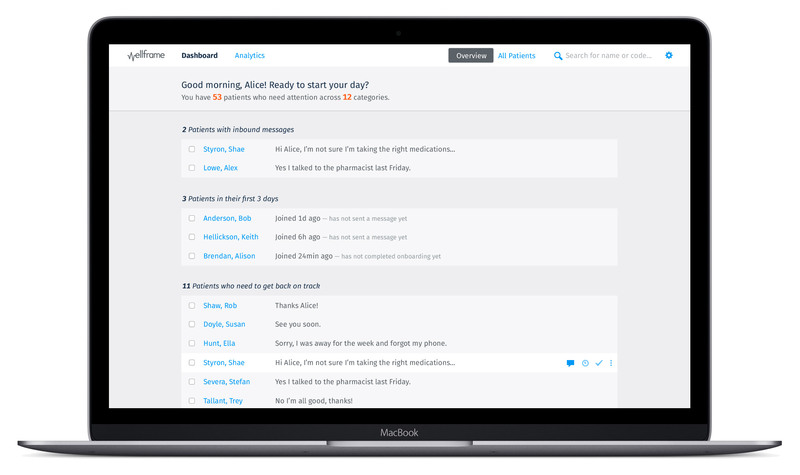 Personalized clinical care plans are delivered in the form of an interactive daily health checklist for patients on their mobile device. It offers daily guidance, medication reminders, customized multimedia content, physical activity tracking, as well as a direct connection to their medical team for continuous support. The medical team monitors progress and acts upon exchanges through a secure web dashboard where they can send personal messages, manage the patient's health and get actionable alerts on high-risk cases while keeping track of a substantial population of patients. 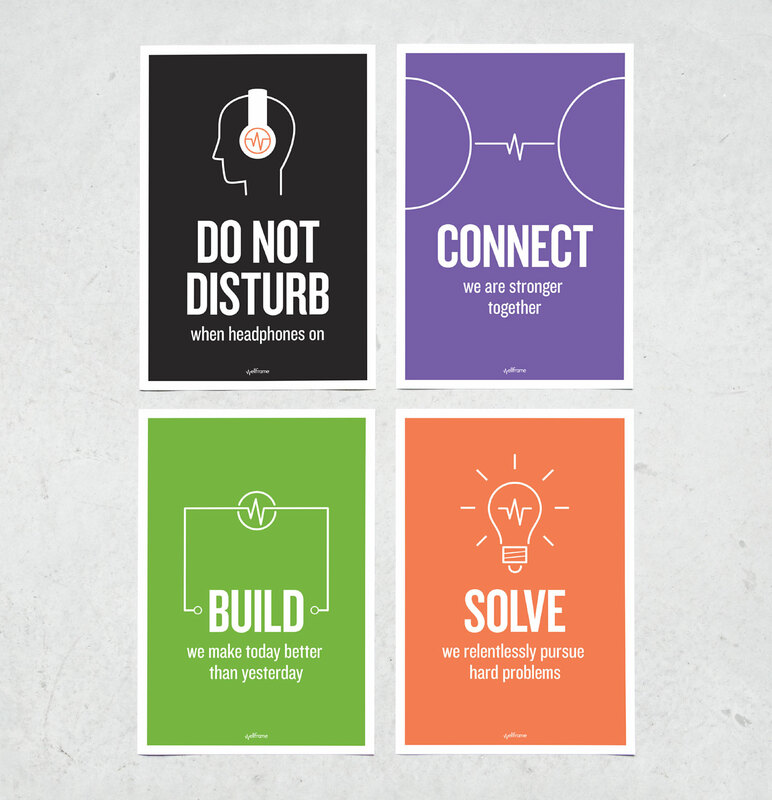 I began as the sole designer at the early stages of the startup of 4 co-founders and helped in its growth to a 30+ employees company over a few years. That involved working closely with clinical, engineering, sales teams, and users, pushing forward the UX & UI design of both the mobile app (on iOS and Android) and web dashboard, producing marketing & promotional materials, etc. 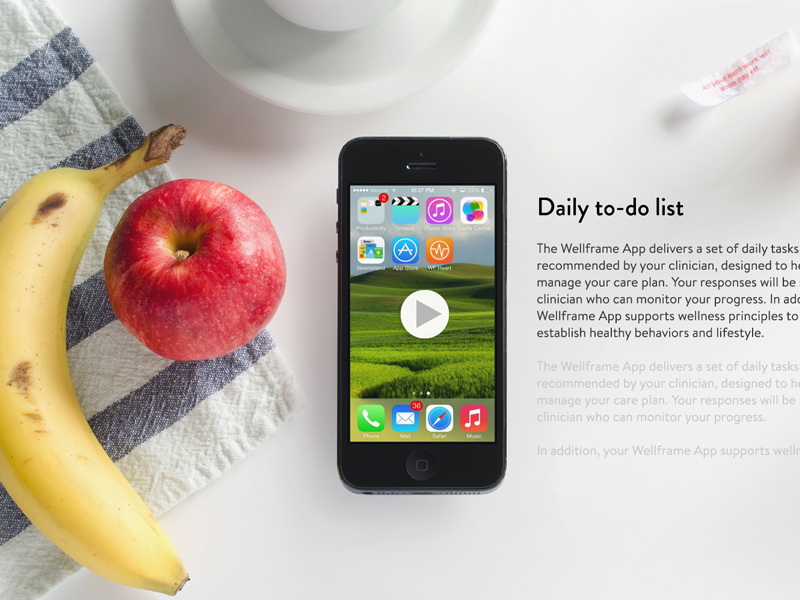 The Wellframe patient-facing mobile app is available on both iOS & Android and requires a special access code that the users obtain from their Care Team or health program. 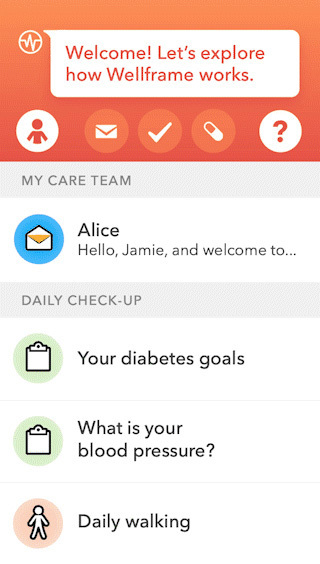 The app itself started as a basic to-do list customized to a user’s specific health condition. 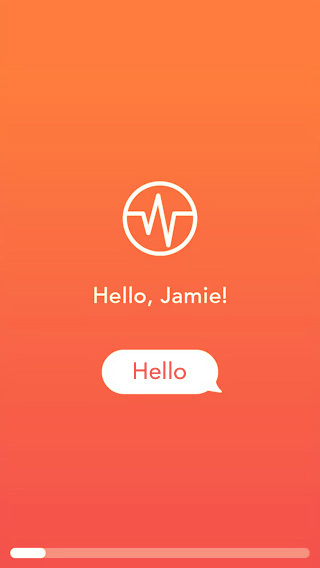 At the time the core features included a pedometer to track a patient’s physical activity, one-way messaging and minimal medication reminders. It eventually grew to have many additional features such as two-way messaging, advanced medication management & reminders, health & wellness tracking, and a whole informative multimedia content library among other things. 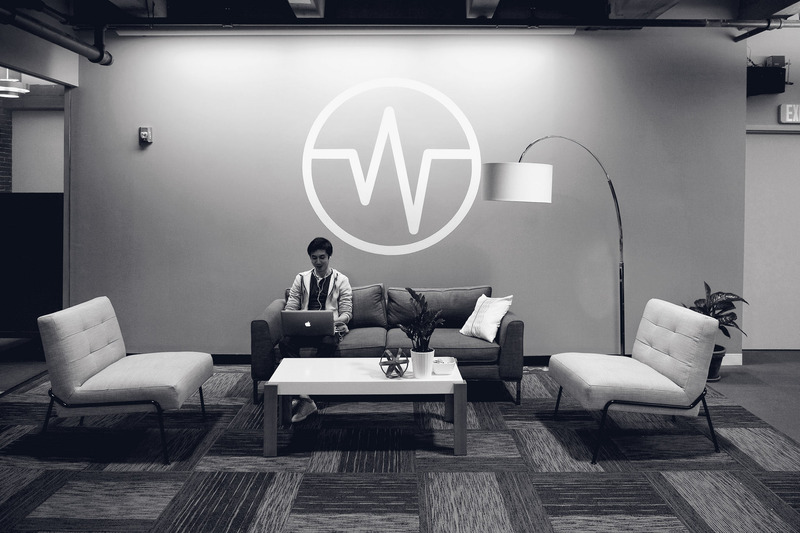 With continuous data-monitoring comes data analytics. The patient, as well as the Care Team, can consult a comprehensive report of the former’s progress in the Care Program, mainly around tasks completion and communication. This ensures a better adherence to the program and a faster reaction in case a potential problem is flagged. The main challenge across the product’s development was to always consider the diverse demographics of the user base, which could easily range from young teenagers to older generations. Therefore, accessibility and familiarity with technology was a major factor in designing the interface and experience. 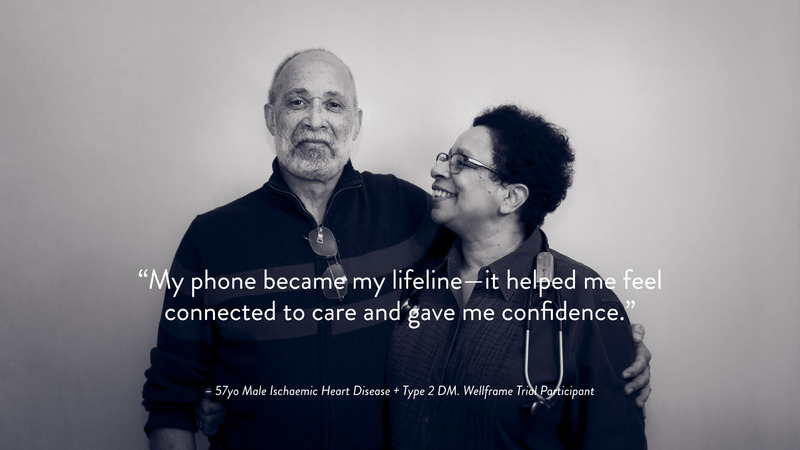 Simple interactions that are obvious to younger people might not be so intuitive to an elderly using a smartphone for the first time (for instance basic interactions like using an on-screen keyboard), as we quickly found out through user tests. Hence not only did the onboarding and the first contact with the app need to be as clear and instructive-but-straightforward as possible but it was also important to provide directions on how to even use a device to download and get to the app itself. A major part of the service is to allow seamless communication between a patient and the Care Team. 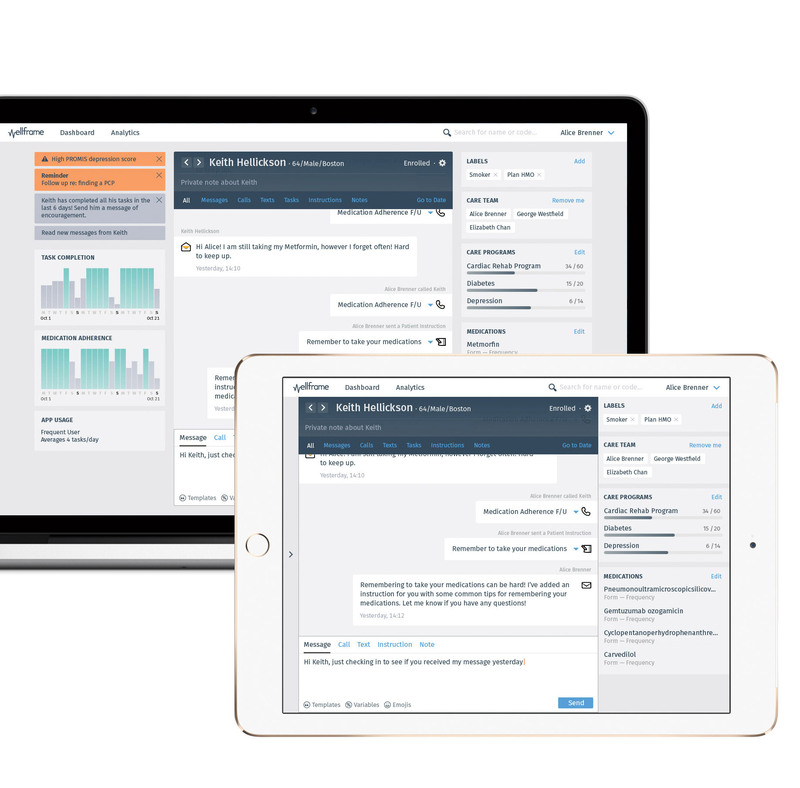 Either for accounting general progress in the program, asking questions about relevant issues, or reporting critical emergencies, the messaging is crucial within the platform. The patient side of the messaging had to be as simple as possible to cater to the diverse demographics. As such, it was designed to have the bare minimum and also make use of the familiarity of existing messaging apps. 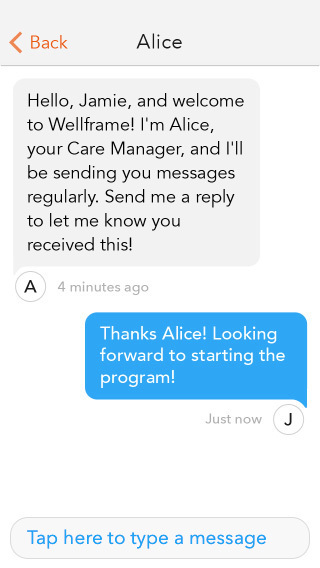 The Care Team’s messaging view, on the other hand, is more detailed and complex as it is used to serve a high number of individuals with varied levels of needs. 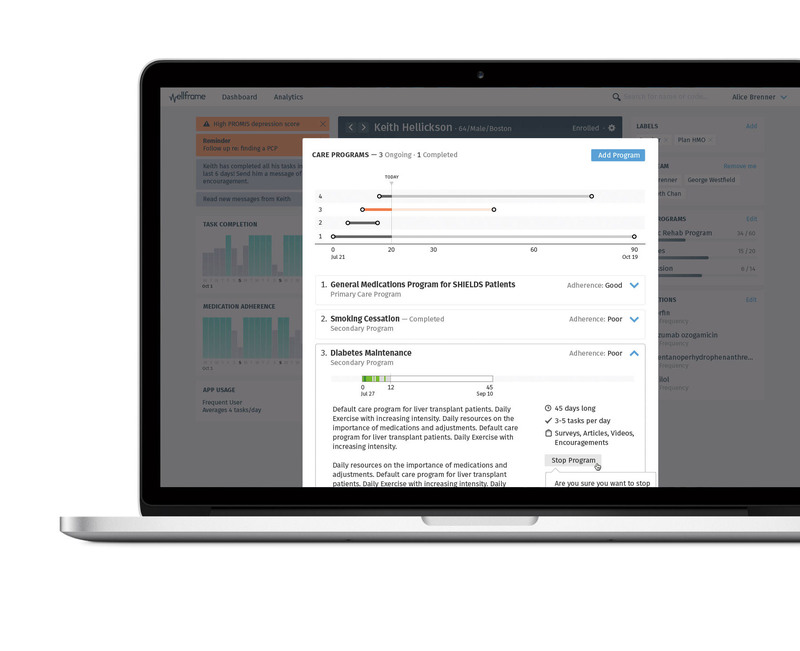 The Wellframe dashboard is where the Care Team engages every day to manage, interact with, and oversee the condition of their population of patients. They have access to all patients’ information and status, arranged judiciously as a daily overview with critical issues shown first, cases needing special attention next, and finally, a list of all the patients. As the Care Manager goes through the list of patients’ profiles, she can dive deeper into a particular one. 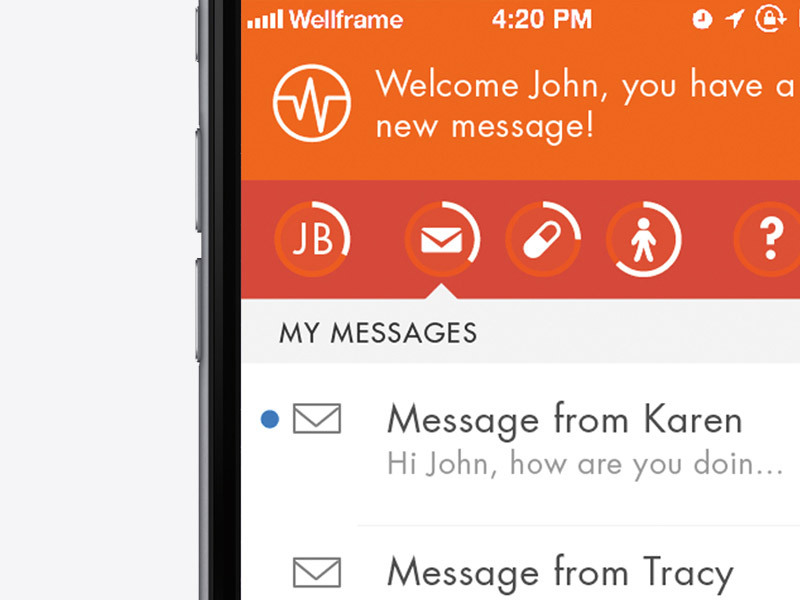 In this more detailed view, the central part of the interface is the messaging component that allows direct communication with the patient. All other relevant information is also displayed next to or inside the messaging component itself. This includes immediate health alerts, progress in the Care Program, etc. There are also a wide variety of actions pertaining to a patient. For instance, viewing and assigning medication prescriptions, modifying the programs’ parameters, sending specific instructions delivered to the patient and adding private notes for the Care Team among other things. 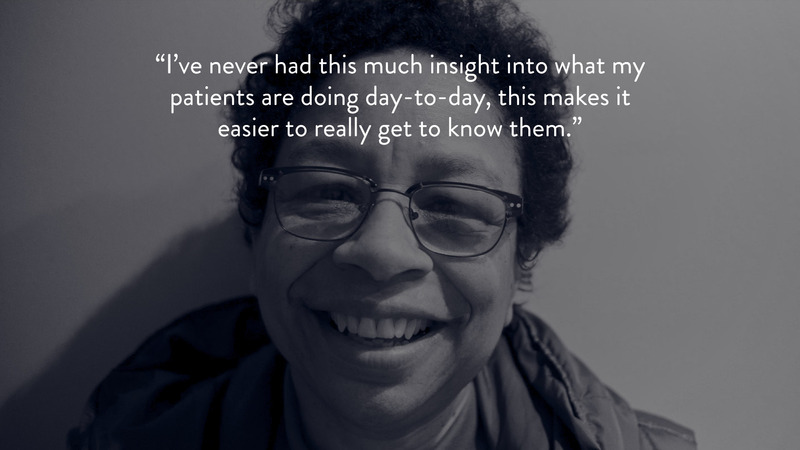 This detailed insight into a patient’s file with direct communication at hand’s reach on a single page dramatically increases the efficiency of care given over a large population. A giant U used as part of the branding and promotion materials for U×U Music Festival in Umeå, Sweden.